Focusing on clock manufacturing since 1990's, Elite Electronics Group Limited has gained rich experiences in clocks industry. We have our own registered trademark “ELITE” and provide one-stop service from material purchasing to inspection. OEM/ODM orders are welcomed. By our clocks with original design and durable quality, we endeavor to make the time unique for everyone. We design and craft a wide range of clock products, which include quartz wall clocks, alarm clocks, LCD/LED clocks, radio controlled clocks, cuckoo clocks and other novel clocks. Besides variety in category, our products are also various in different materials, like metal, glass, wood, plastic, cork, bamboo, flocking and so on. Each of our clocks is featured with function, beauty and creativity. Welcome to visit our 2000 ft² showroom in Guangzhou Office to get more of our product information. 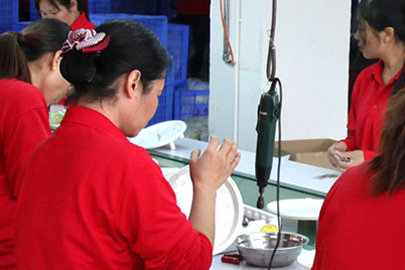 Equipped with efficient automatic production lines and test facility, our 6,000㎡ factory is ISO 9001 and BSCI-certified. 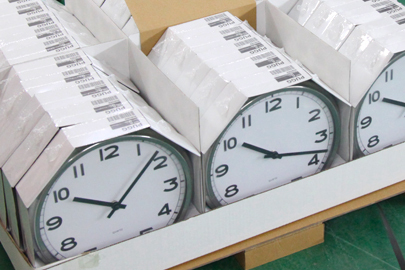 With our professional production team and QC team, we can produce over 3,000,000 pieces of qualified clocks per year that are sold to Europe, America, Japan, South Korea and more, which enable us to establish stable and long-term partnership with many famous brand companies. Quality is one of the utmost importance to success. We believe our clocks products are made not only to show the time, but also stand the test of time. We always use high quality materials and apply thoughtful designs to our products. All of our products are CE, RoHS, REACH and FSC compliance. Our Quality Control process strictly covers each part of production to make sure every piece of clock is tested and qualified before delivery. Our highly-integrated production mode enable us to provide our clients with competitive product price. 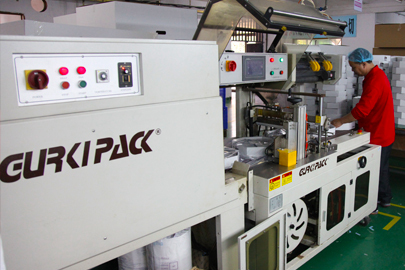 Competitive product price is the strong point of our factory which always boost our clients to earn the market. For years, we have paid most attention on product development and research. Our own creative R&D team, who are adept with the use of AutoCAD, Solid Work and Photoshop, refresh our product designs every season. We also keep cooperation with famous foreign designers to introduce novel and innovated products to meet the demand of market. Our experienced marketing team who know well about the production process and the demand of customers, always promise to provide high-efficient and attentive service. Committed to the world sustainable development, we keep exploring new eco-friendly materials to innovate conventional clock designs and production. 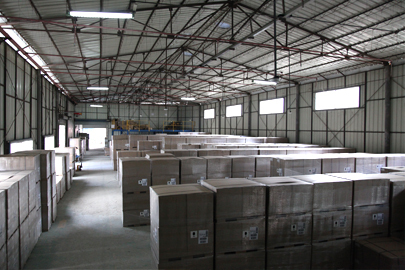 We also invest in the factory facility to save energy and improve efficiency. With the aim to nurture and value our nature, we stick to our sustainable development orientation and develop step by step. Equipped with efficient automatic production lines and test facility, the 5,000 m2 factory is BSCI certified, Target and Walmart and other multinational corporations audited. 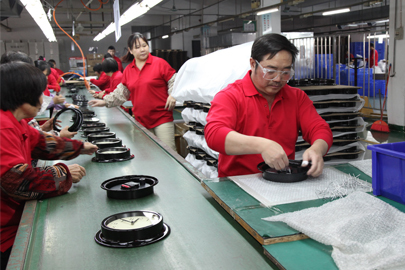 Rely on the professional production team and QC team, more than 400 million qualifying clocks are made every year.